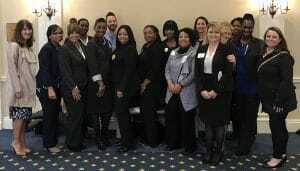 On February 15, 2018, 17 members of Humphrey Management attended the Maryland Affordable Housing Coalition’s Housing Day in Annapolis, MD. Ivy Dench-Carter, President, MAHC, served as MC for the event, rallying legislators and private industry influencers alike to fully fund the Rental Housing Works initiative. Bi-partisan legislators from districts throughout Maryland made appearances to show their support for the affordable housing industry. Afterwards, attendees visited personally with legislators to communicate the dire need for funding to develop additional affordable housing projects in Maryland. For more information on the state of Rental Housing Works in Maryland, and the impact that companies like Humphrey Management make in our communities, please visit the National Low Income Housing Coalition or the Maryland Department of Housing and Community Development.